Hatters boss John Still would have no concerns about playing Alex Lawless at right back for tomorrow’s League Two clash at Morecambe. 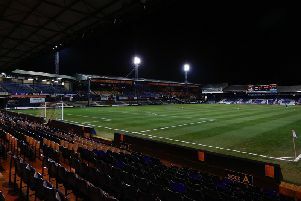 The 30-year-old enjoyed a sparkling impact when coming off the bench at the weekend in place of Stephen O’Donnell, setting up Jack Marriott’s opening goal as Luton eventually ended AFC Wimbledon’s resistance. When asked if he would consider selecting him from the start, Still said: “Yes, always, because I know that he can play there as Scott Cuthbert can also play there. “So absolutely, it’s not something we wouldn’t consider at all. “He came on at the weekend when quite rightly if you’re going to go 4-4-1, which they did, it was an ideal opportunity for two attacking players. Although O’Donnell clearly struggled throughout the hour in which he was on for, Still wasn’t overly critical of his display, continuing: “Steve’s been improving and improving and improving, game on game on game and he was really poor on Saturday. “But it happens. Sometimes people have a bad day. In fact we won on Saturday and yet one or two players who I think have been particularly good in the last four or five weeks, I don’t think played as well as they have done. “They’re not all going to play well, but the important thing is the job for the team. “Trying to play the right balls in the right areas at the right time. Trying to cross as early as you can, when you make a cross and it goes out of play, it happens. “It’s when they try and do something different that will throw everything out. “If we get the ball down and are expecting a cross, everyone arrives in the box and you play a negative pass, it gets cut out, we’re all in front of the ball instead of having people behind the ball. “Normally they’ll tell you exactly what you think, they’ll sometimes throw in, ‘yes I’ve not been as good as I can be, but I think I have done a bit of this and a bit of that’. “They give themselves a little pat on the back and there’s nothing wrong with that.